When I was in high school, I was absolutely in love with Herbal Essences. I just couldn't get enough! I especially loved the pale yellow bottles -- they made my hair super silky and shiny, and they smelled so delicious. 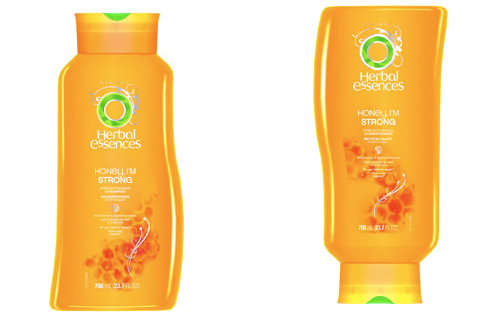 I fell away from the fold when it came to Herbal Essences over the years, but now I'm back -- and it's all thanks to Herbal Essences Honey I'm Strong Strengthening Shampoo and Conditioner. This shampoo and conditioner captured my heart the first time I used them (about three months ago), and my hair has only gotten better and better since. My strands are silky, they're shiny, and most importantly, they're healthy. I've been in the process of growing out my hair for what seems like forever (real time: over five years), and it's finally looking and feeling its absolute best. My hair had been dry and damaged from constant coloring and way too much heat styling. The formula in this duo promises to reduce breakage and strengthen strands, and it's followed through on both of those in spades! Plus, it smells like honey. And, since I love anything having to do with the sweet scent (or taste, but I promise I'm not eating this duo) of honey, of course I just can't get enough! Herbal Essences Honey I'm Strong Strengthening Shampoo and Conditioner retail for $4.50 each at drugstore.com. I also love Herbal Essences! I use the blue bottle one, Hello Hydration and it makes my hair feel silky and smooth (thanks to the coconut). It also has a nice smell to it. Affordable and amazing! !